In July 2014, Todd was diagnosed with Acute Lymphoblastic Leukemia after initially being diagnosed with dehydration and a virus. It all happened suddenly and his parents began juggling work and constant trips to Cardinal Glennon along with providing for their other children. ENIN was there to provide financial assistance and to give Todd a laptop so he could keep up with schoolwork while in the hospital. 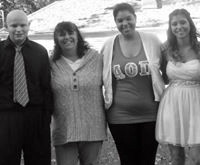 All the while fighting Leukemia, Todd has worked tirelessly to raise awareness. In 2015 he founded the Painting the Town Gold effort within District 7 and met the goal of raising $100,000 toward research in the month of September, Pediatric Cancer Awareness Month. His inspiring goodwill and strength in the face of adversity is truly moving.